Product code: ES8337 Categories: Art Deco, Art Deco Rings & Art Deco Engagement Rings. Here is an exquisite Art Deco diamond ring dating from the 1920’s that showcases and highlights the beauty of jewellery from this decadent era of the 1920’s to the 1940’s. 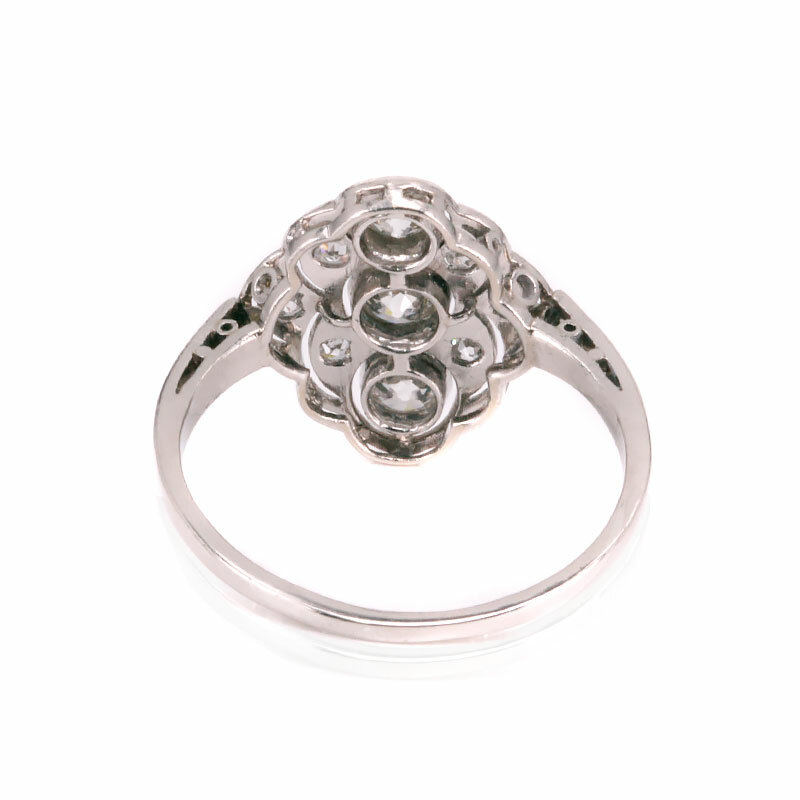 The design of this ring is the epitome of Art Deco jewellery and was entirely hand made in platinum. A ring with such fine detail such as this could only have been made in platinum as it is the only precious metal that is used in jewellery that can be drawn into such a fine wire and retain the strength to hold and support the diamonds. Running down the centre are three European cut diamonds that total 0.64 carats and with the wonderful scalloped design on the side, there are three single cut diamonds and a further one on the band that come to a total of 0.24 carats. And then looking closer at the setting, you will see the elegant crimping along the edge of the setting which is knows as millgrain setting. This elegant setting highlights the quality of the ring and is so fine to admire. Whereas modern millgrain setting is quite harsh, this has the correct softness to it that shows the skill of the jeweller who made this ring. Measuring 14.8mm by 16.7mm across, this is a spectacular example of Art Deco jewellery at its finest. Tags: Art Deco diamond engaement ring, Art Deco Diamond Ring. 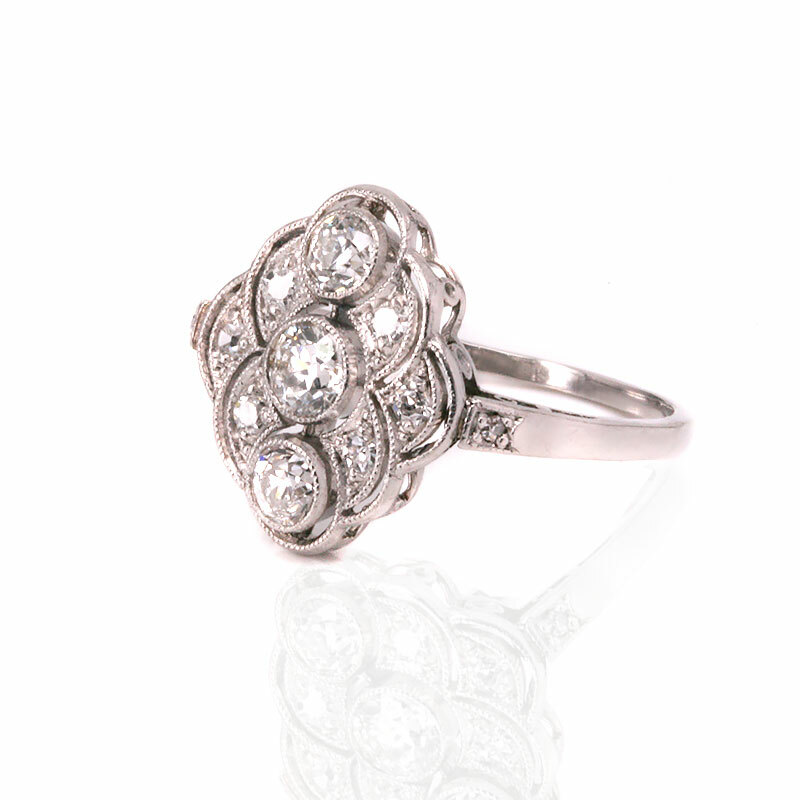 This ring would make a stunning example of a genuine Art Deco diamond engagement ring.